You have the option of creating a short comment for each of your coded segments. This might be an overview of the coded segment or a comment about its significance for your analysis. Comments are particularly useful for the category development. In the “Document Browser”: Double-click on a coding stripe or on a code name – or right click on the coding stripe and select Edit comment. 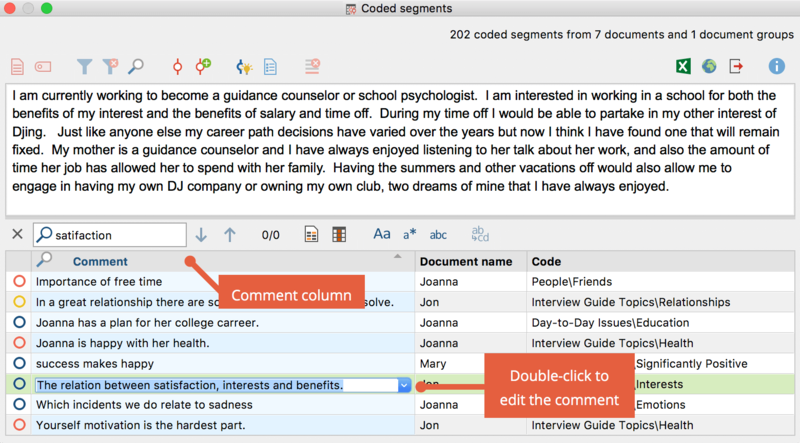 In the “Overview of Coded Segments” or the table view of “Retrieved Segments”: Double-click in the “Comment” column to add a comment directly in the table. A window will appear in which you can enter the comment. The comment can contain up to 255 characters, which corresponds to approximately 2 to 3 sentences, that is, the length of this paragraph. Use Shift + Enter (⇧ + ↵) to create a line break. You can easily see if a comment has been written for a coded segment when you look at the code symbol. Normally the inner part of the little circle is white in color, independent of the color of the code symbol. When a comment is attached, the inner circle appears in the same color as the outer line of the symbol. If you hold the mouse on the coding strip, the comment appears in the tooltip. 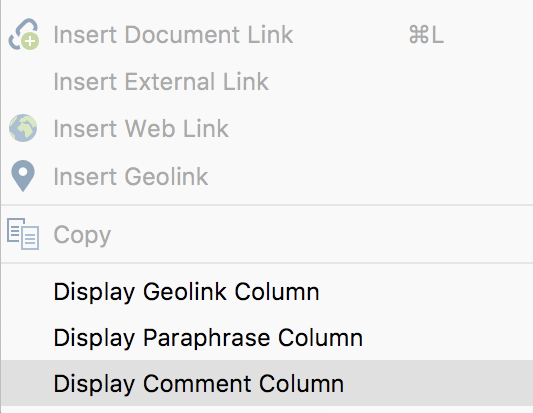 Just as you can use MAXQDA to display the comments on a segment at the end of the page, you can also display the comments on coded segments next to the text: right-click on the document displayed in the “Document Browser” and select the Display comment column. As long as you haven’t changed the standard view, you can find all of your code comments in the “Overview of coded segments” table in the second column. You can also insert new comments and delete/change old ones from this view. By right-clicking on the column header, the overview is sorted according to this header. You an also sarch for comments: right-click on the “Comment” column header and select Search.